Parking and traffic are common friction points with big projects in Arlington. Even schools. 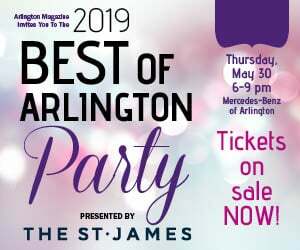 “The neighbors don’t want everyone parking in their yard,” says Lisa Stengle, executive director of planning and evaluation for Arlington Public Schools. During her 20 years at APS, student enrollment has nearly doubled from about 14,000 to 27,436—meaning more kids, parents, buses and cars. But finding space for garages and surface lots near schools can be a costly use of limited education dollars. Two new elementary schools are in the works to accommodate the influx of students. Alice West Fleet Elementary will open in fall 2019 just south of Route 50, and the Reed building in Westover will be converted from a child care center to an elementary school in 2021. 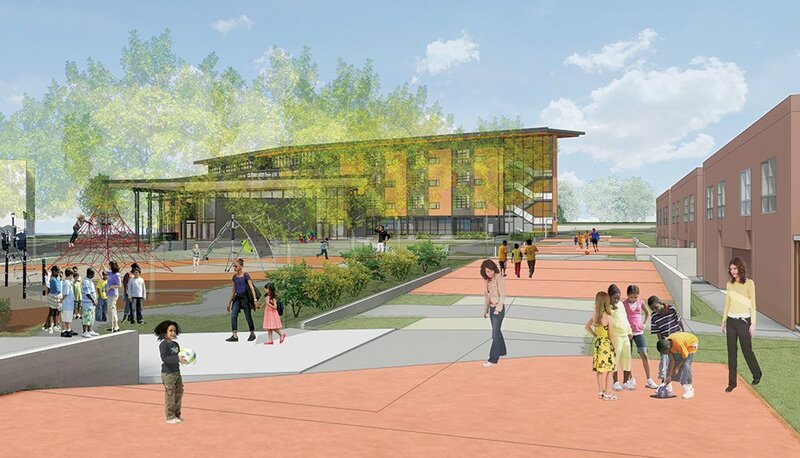 A rendering of the Alice West Fleet Elementary School site, set to open in fall 2019. Image courtesy of APS. Fleet, which is being built next to an existing school/community center (Thomas Jefferson Middle) on top of a former surface parking lot and athletic fields, will have underground parking, even though it’s expensive, Stengle says. There’s nowhere else for cars to go. Looking ahead, technology could help soften some of the chronic parking and traffic problems that vex neighbors, says Lisa Nisenson, an urban planner and smart growth expert who lives in Lyon Park. Dynamic metered parking (which raises hourly rates during peak times) can incentivize people not to drive during busy periods. And parking apps that point drivers toward available spaces help to reduce congestion created by cars circling and looking for parking spots. Electric bikes present a car-free alternative for navigating hilly areas, and services like Uber and Lyft are commonplace. But for now, car dependency is still a thing for many Arlingtonians, and parking remains a flash point. Image courtesy of American Legion. 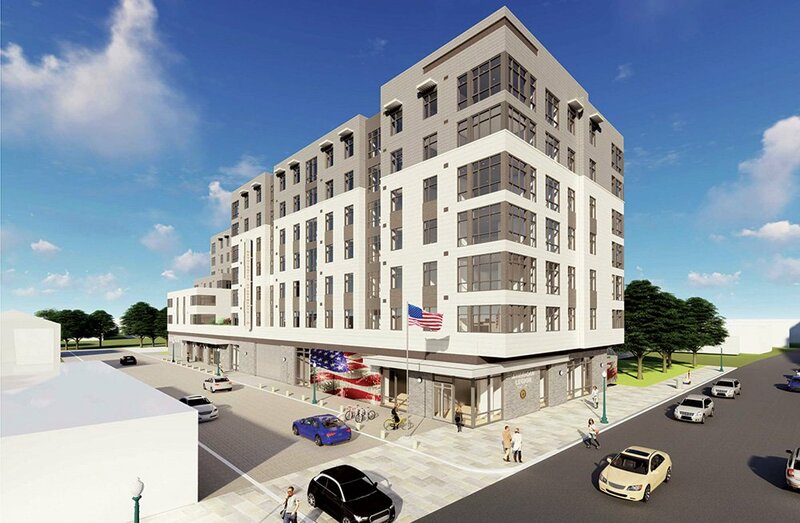 The YMCA’s redevelopment plan includes two contiguous properties with an affordable housing component (rendering below). Map illustration by Laura Goode. 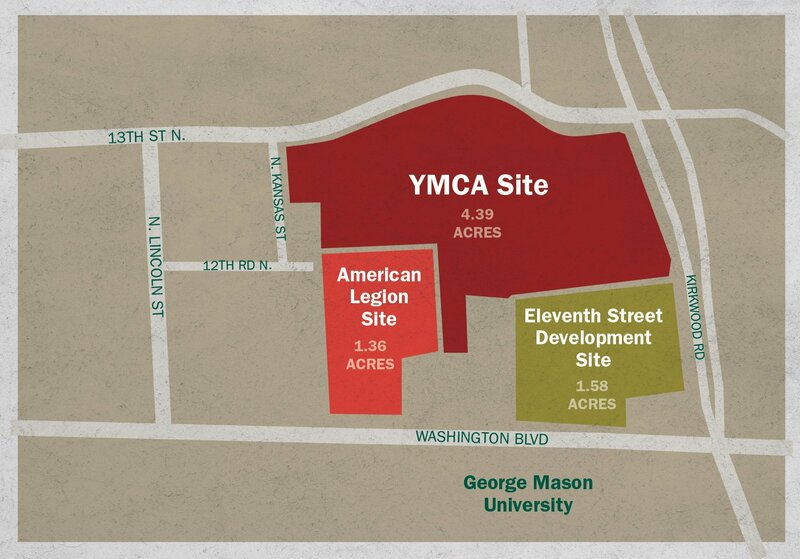 After two years of working with the county on a land use plan, the Y is still several years from breaking ground on a new structure to replace its dilapidated building. The goal is to eventually build a $30 million, state-of-the-art facility (offering indoor swimming, tennis and other community amenities), paid for, in large part, with funding from new housing built on the same 4.39-acre site. 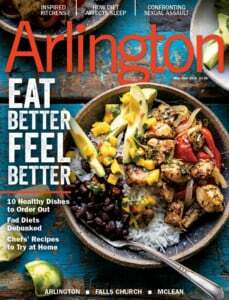 The type of housing is yet to be determined, Raphael says, but there is talk of creating affordable units to help fill the “missing middle” in Arlington’s housing market. “The Y wants to be a good neighbor and has been for decades,” she says.